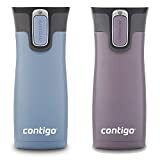 The Contigo AUTOSEAL West Loop Vacuum-Insulated Stainless Steel Travel Mug is by far the best-selling travel mug on Amazon. They typically sell for between $32 and $38 for a pair, which makes the per-mug price between $16 and $19. That’s a fantastic price for a sleek travel mug that’ll keep your hot drinks warm for up to 5 hours and your cold drinks ice-cold for up to 12 hours. Right now, however you can snag a Earl Grey/Dark Plum set on Amazon for only $23.13, which drops the per-unit price to just $11.57. You’re nuts if you pass up this deal, and it’s definitely going to sell out soon so you had better hurry.